These expert-backed hair growth treatments and lifestyle solutions will help you regrow thinning hair. These expert-backed lifestyle solutions and hair growth treatments will help your mane thrive. Maybe at first you notice extra hair going down the drain in the shower or more strands than usual left behind on your hairbrush. While you might feel like the only woman facing this, the surprising truth is female pattern hair loss (FPHL) is a lot more common than you think. In fact, half of all women will suffer hair loss at some point in their lives, and 40% will experience FPHL by the age of about 40. And there's a good chance those stats are off, says Joshua Zeichner, MD, director of cosmetic and clinical research in dermatology at Mount Sinai Hospital in New York City, because women are often too embarrassed to talk about it. A common hair loss myth is that women lose their hair for the same reasons as men. “But FPHL does not have the same pattern as male pattern hair loss,” says Francesca J. Fusco, MD, assistant clinical professor of dermatology at Mount Sinai Hospital in New York City. “It tends to be diffuse or frontal or temporal, and it can be inherited through female relatives.” While male pattern hair loss has been much more researched than women’s, we do know that it’s at least in part genetic and related to the androgen hormones, mainly dihydrotestosterone (DHT). In other words, there are several causes of hair loss besides genes, including stress, diet, and other lifestyle factors. While we can’t control our genes, we can control our lifestyle. Making these expert-recommended changes may help your thinning hair regrow. “Significant psychosocial stresses can result in hair loss,” explains Dr. Zeichner. In a phenomenon called telogen effluvium, stress shocks hairs to move into the "resting" phase, in which they all fall out at once. "This is the same type of condition that women typically experience after they give birth or after a major surgical procedure," Dr. Zeichner explains. "These patients typically develop rapid thinning of the hair along the temples.” Finding stress management techniques is key, whether it’s meditation, yoga, hitting the gym, or adopting a mantra. “Protein is critical to healthy hair,” Dr. Fusco says. “Lean meat, fish, poultry and beans are all great sources. Iron is also important; low iron can lead to anemia, which can lead to increased hair shedding. 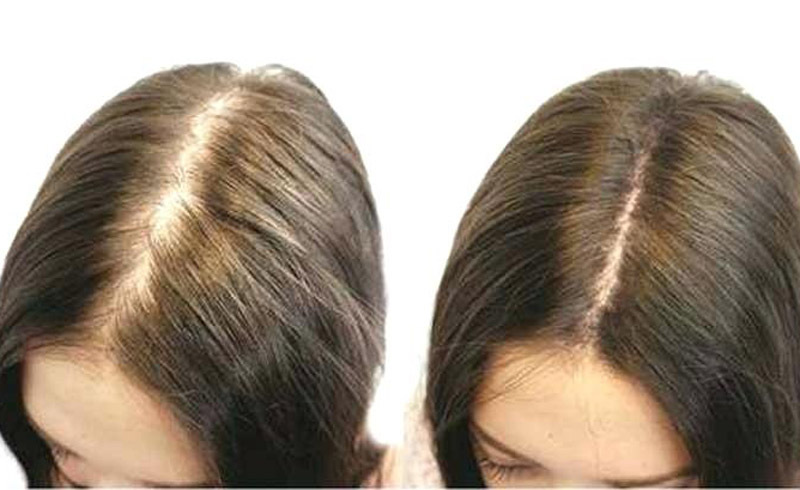 The great news is that with proper diet and supplementation, this type of hair loss is reversible.” Deficiencies in biotin and zinc are also clearly associated with hair loss, and magnesium is necessary for healthy hair growth. Taking a natural vitamin supplement that is designed to boost hair growth can help, and even multivitamins can give your hair a boost, says Dr. Zeichner. The two most popular hair supplements on the market that have been evaluated and shown to help promote healthy hair are Nutrafolthis link opens in a new tab ($88; amazon.comthis link opens in a new tab) and Viviscalthis link opens in a new tab ($130 for 180 tablets; amazon.comthis link opens in a new tab), Dr. Zeichner says. As a natural alternative to Rogaine, essential oils may be worth a try. In one small study, alopecia areata patients massaged rosemarythis link opens in a new tab, peppermintthis link opens in a new tab, thymethis link opens in a new tab, and lavenderthis link opens in a new tab in a mixture of jojoba or grapeseed oil into their scalps daily, while a control group used only the oils. Forty-four percent of the participants in the essential oils group showed improvement, compared to just 15% of the control group. Talk to your dermatologist before you try either minoxidil or essential oils on your scalp. Another way to save your strands is to always treat them gently. That means no rough combing, and never brush hair when it’s wet and weak. Skip styles that pull, such as tight ponytails and updos. Never vigorously towel dry, which leads to breakage. Take a break from daily blowouts and over-styling, which irritate the scalp. Batiste Dry Shampoosthis link opens in a new tab ($6; amazon.comthis link opens in a new tab) are fantastic for volume; apply them to roots. Also, trimming off even a couple of inches will instantly add volume, get rid of the excess weight of longer hair, and help hide any thinning areas. But if you don’t want to go shorter, get layers that frame the face to mask fine hairlines. You could also camouflage thinning areas with spray-on root touchup products or even eyeshadow, says Dr. Fusco. Brush on Madison Reed Root Touch Upthis link opens in a new tab ($30; ulta.comthis link opens in a new tab) for a quick, easy fix. There are a number of hair mascaras to disguise growing out roots, which also bulk up the appearance. Still losing strands even after you’ve made these lifestyle tweaks? If excessive shedding continues for more than a month, see your doctor.